Explore the fascinating world of e-textile art with the creator of super cute, electronics-infused creatures! I had no idea what Cat of Cacophonous Creations looked like, but I ventured to guess the woman with purple hair and a strange, half cat, half octopus creature next to her coffee cup, might just be the person I was looking for. “It's a Catkeypus,” she says as I sit down, pointing to the creature. As in Cat-Keyboard-Octopus. Before I have time to launch into the standard “so tell me about yourself” interview questions, Cat has hooked the Catkeypus to a power source and begins pressing on its legs, causing different, high-pitched frequencies to emit from the creature. The Catkeypus is an experiment in e-textiles, a craft blending fabric with electronic components and conductive materials. E-textiles can be as complex as “smart clothing” that monitors body heat or as simple as a hat with a light sewn into it. The Catkeypus utilizes conductive threads sewn into each leg, which connect to an embedded circuit that reacts to the energy emitted from human skin touching the exposed threads. Cat produces more creations from out a large bag: a light-up D12 necklace, a pair of illuminated bunny ears, a light-up flower brooch, and a super adorable creature named Squeakapus, which utilizes the Drawdio circuit. Circuit boards, LEDs, batteries, and other electronic components are embedded in or attached to the plush, hand-sewn bodies of her creations. Some creatures, like her little the voodoo doll with light up eyes, rely on special conductive fabrics and user interaction to function. The electric circuit of the voodoo doll is completed when it's stabbed with a metal pin. Originally an English graduate from Huntsville, Alabama, Cat moved to Portland nine years ago. Around 2009, she was invited by a friend to check out Dorkbot. From there, she heard about an e-textile workshop taught by Lynne Bruning. The workshop inspired her to begin a rather ambitious e-textile project of her own: a biking glove that functions as a turn signal. 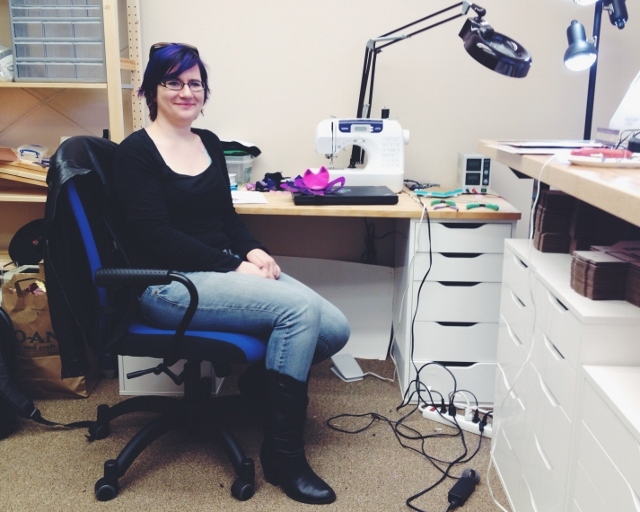 Cat now makes and sells e-textile creations through her business, Cacophonous Creations. She also works as the community manager for OSH Park, a Portland company that creates custom printed circuit boards. (Both Cacophonous and OSH Park are members of the Portland Geek Council). Cat organizes and hosts a variety of events that get people excited about e-textiles. “I enjoy introducing people to the world of soft circuits since soft textures are not what people tend to think of when they think about electronics,” Cat says. If you're interested in learning more about the wonderful world of e-textiles, visit Cat at the Lovecraft Bar tomorrow for her (21 and over) Soft Circuits workshop. It meets the 4th Saturday of every month, and Cat adds that the workshop in May would be a great time for people putting the finishing touches on their outfits for the Starlight Parade. Cat also leads OSH Park's twice monthly, all-ages Crafty Circuits hangouts at Flux. Cat would also like to give a shout out to Shannon Henry, local e-textile artist, and Leah Buechley, inventor of the LilyPad and the inspiration for the Catkeypus.